coupons! i am an extreme couponer. although the prices on my website do not reflect the prices i get my groceries for, i would urge you to consider looking into couponing. couponing the right way will allow you to buy products at rock bottom prices. coupled with a coupon, you should be paying little to nothing for it. i usually stock up on those items, which helps me build a stockpile. that way, i will have a large number of specific items and will not need to buy those items for a long time. for great ‘how to’ articles on couponing 101, visit some of my favorite sites – homemaking mom, moola saving mom, and coupon teacher. if i am out of an item and do not have a coupon for it, i will usually buy the generic brand. using coupons at the checkout can save hundreds in the long run. also, if you can not afford to pay $1.50 for the washington post every sunday, use the coupons tab on our website for free. it has hundreds of coupons that can help you save! plan your meals. write down every meal you plan to prepare for the week. list those items and other items you may need for the week only. when you go to the store, buy only what is on your list. however, be sure to buy enough so that you will not have to make another trip to the store until the following week. making additional trips to the supermarket within the week will slowly take a toll on your budget. also, we all know not to shop on a empty stomach, right? outsmart your kids! taking the kids to the supermarket can be dangerous in more ways than one. some kids have limited patience when it comes to grocery shopping. with their anxiety to get out of the cart and go home to watch spongebob, you may feel rushed and miss out on deals. also, having them begging for snacks and toys while you are shopping, can add up at the checkout. go vegetarian. avoid eating meat/seafood every night. preparing salads, vegetable casseroles, soups/stews, frittata’s, etc. is a great alternative to meals that contain meat. a typical family of four can save about $3.00 per meal or $15.00 per week or about $800 a year by going vegetarian several times a week. freeze your food. check out my article on freezing here. wait and buy meat when it’s in the ‘reduced’ section. some stores cut meat prices drastically when the ‘sell by’ date is that day or one day away. sometimes you can buy those meats for less than half the sale price. stock up and freeze! 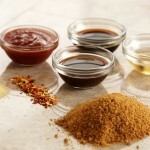 make your own marinades, sauces, salad dressings and rubs. 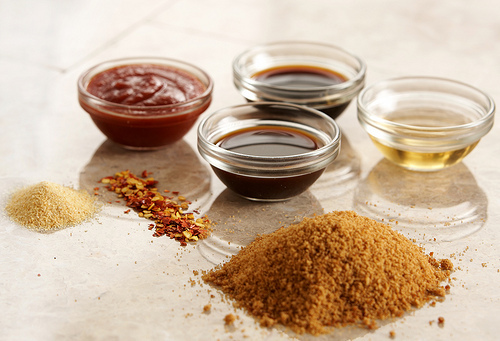 most bottles of marinades are about $3.00 a bottle. making those same marinades yourself can cost way under a $1.00. not only does it save money but you can control the quality of ingredients. use slow cookers. slow cookers use just 100 watts of electricity, which means that if you use it once a week for eight hours at a time, it’ll only cost you about $0.20 a month in electricity! also, you can use inexpensive cuts of meat, and the crockpot will works its magic and make it extremely tender. do i have to mention it saves time as well? set it and forget it! consider using chicken bouillon sometimes instead of chicken stock.bouillon is a clear liquid made from chicken, vegetables, spices and water. i used chicken stock ALL THE TIME! i found that i was spending a lot of money on chicken stock. a typical 14 ounce can (about 2 cups) of stock is about $1.29 (via peapod). a jar of chicken bouillon is $2.19 (via peapod), for 25 cubes. given that each cube makes 1 cup, i am getting 25 cups of chicken stock for $2.19! unfortunately, they can have a high sodium content, and sometimes contain MSG. i look for reduced sodium and no msg jars. make your own baby food. check out my article on making your own baby food here. consider sometimes using canola oil instead of olive oil. olive oil has proven health benefits and is good for you. however, canola oil is a great oil as well. it is significantly cheaper than olive oil, possesses the beneficial omega-3’s and is very low in saturated fat. save your bread! 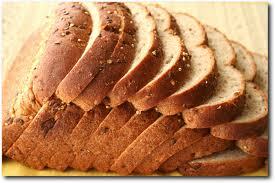 some grocery stores sell bread close to expiration for 10-50 cents less. if you have a freezer, stock up. 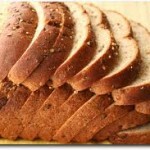 buy loaves of garlic bread, baguettes, rolls etc. on almost every shopping trip and stash them in your freezer. also, don’t toss your day old bread. it makes great breadcrumbs and is good in bread pudding and french toast! stay clear of buying pre-chopped foods. in today’s busy society, it is very tempting to buy items that save us time! unfortunately, in most cases it comes with a price tag. studies show that buying pre-packaged items are 50 to 75% more expensive. we are paying for the handling, washing, transportation, refrigeration, and packaging of those items. pre-shredded cheeses fall in the same boat. buying a block of cheese and grating it yourself is usually much cheaper than buying pre-shredded cheese. rarely, the price of pre-packaged/shredded items can be the same as items you can cut/shred yourself. in those cases, hook it up! consider using canned tomatoes vs fresh. buying fresh tomatoes in the supermarket can be costly. there is always a sale on canned tomatoes that you can stock up on and always a generic brand that offers a great price. if you have a garden, nevermind! i use a lot of fresh tomatoes in my dishes since i have a garden (read more about saving money on ‘planting a garden’ below!). if you prefer fresh tomatoes rather than canned, using your local farmers market will probably beat out your supermarket prices. plant a garden. 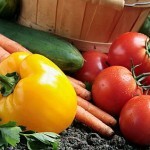 you will be surprised how much money you can save from having a garden! 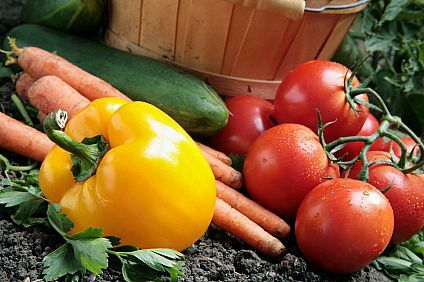 a $50 investment of buying the plants and seeds can save you at least $500 a year depending on what you plant. this year was our first garden. we planted tomatoes, zucchini, jalapenos, okra and bell peppers – things i use all the time in my meals. we constantly had fresh produce to use and rarely had to buy veggies at the supermarket! i could not believe how much produce i could get out of a $0.90 packet of seeds! i know a lot of these tips require time. whenever i have a few minutes on saturday, i make the sauces and pre-chop my veggies for my upcoming planned meals to make it easier for my busy week. i may also spend time chopping extra veggies, labeling the freezer bag – ‘1/2 cup carrots’ – and putting it in the freezer. that way, if i need 1/2 cup of carrots, i can take it out of the freezer and toss it in whatever i am making. also, sometimes if i am making a casserole, i take the time to make another one. tossing an extra casserole in the freezer makes it easy to thaw and bake on the days i don’t feel like cooking!